The Bosnia-Herz goalkeeper leaps into action to superbly deny a scissor volley, but the Iranian was offside for the chance. Ethan I will *never* be a Ronaldo fan. CIV complained very little about the penalty call. I'm sure they would have expected to get the same call had the situation been the reverse. Frankly, I think Greece is more boring than Iran, but the matches are about winning, aren't they? Not esthetics..... like rhythmic gymnastics. I guess that explains Messi's poor performances with Barcelona this year... he was saving himself for the World Cup. What should the drink of choice be for tomorrow? Was that Messi's goal assisted by Di Maria? Chen, it came back off the post and goalkeeper, but it may technically go down as an assist. It feels like Iran are offside on every possession. rmf> do what i have done on simultaneous games - watch one on tv and the other via watchespn on a device.. Right now Nigeria can still advance with 4 points.. one 0-0 draw with Iran and one 1-0 win against Bosnia (worst european team?).. They played 2 of their 3 games in South Brazil with nice temperatures.. their only warm game was against Bosnia where the heat was certainly an advantage for them..
That's the easiest and most unimpressive campaign ever..
@T ... I think Memo Ochoa's stock has risen the most ... out of contract to being chased by lots of top clubs. US needs to go for the win. If it gets to squeaky bum time and it's tied, hang on for the draw. @Bristolian, we nearly said the same thing there! & Higuita was defintely the best of characters to watch! I think our play on the wings will be incredibly important against Germany. Bradley and Beckerman will have their hands full with the likes of Khedira, Kroos, and Ozil. But I think we can out pace the Germans out wide in the attacking third. Dzeko is the all-time scoring leader for Bosnia-Herzegovina with 36 international goals. I'd be all for drawing lots in this group. As a neutral for the day, it is the one thing that hasn't happened this World Cup. morty> that's what i'm hoping. better for portugal to win as they have a terrible goal difference..
We're 32 minutes in and Vincent Enyeama is down in pain, but continues after a brief break. No further goals in that one yet - they seem to have got the excitement out of their system in the first few minutes. Is noon too early to start drinking? Sigh... Asia has been woeful for this World Cup... When will we see South Korea's run in 2002 again..
A shot he didn't like. We also need to grow a center back better than Geoff Cameron. He's been shockingly bad. I'm with Gooner. I can never cheer for Ronaldo. Most selfish player in soccer. That's not a bad thing at times. However, Ronaldo's behavior is disgraceful and a huge turn off. 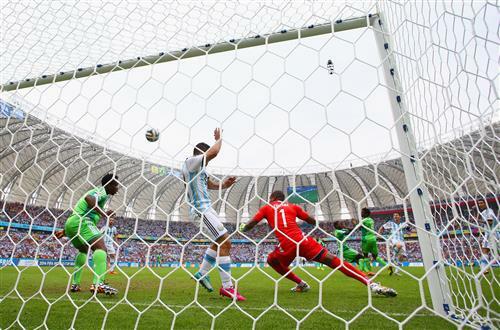 Messi's rocket into the roof of the net. Emir Spahic is down injured for Bosnia-Herz as he stretches for the ball and is fouled, and the stretcher is on for him now. That looks like the end of his tournament. 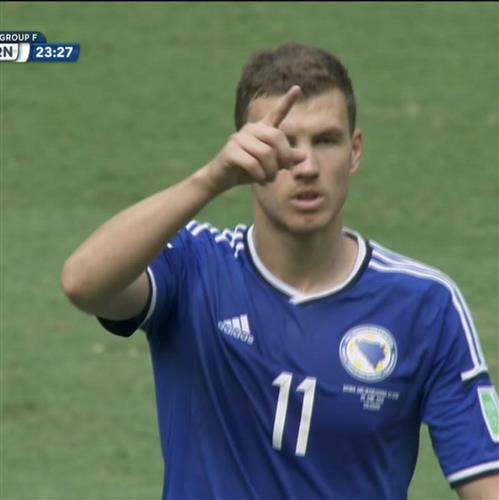 ESPNFC.comBosnia-Herzegovina forward Edin Dzeko gives his team the 1-0 lead over Iran, scoring his first World Cup goal. It's hard to root for a man that built a museum dedicated to himself. SUB: Sergio Aguero is once again injured, and will be replaced by Ezequiel Lavezzi. How many times has he limped off this season?